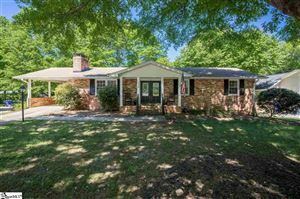 Allison’s Meadow is a quiet neighborhood that is about ten miles southeast of Downtown Greenville and less than ten miles from the Greenville-Spartanburg Airport. The I-185 and I-385 connectors are just a mile and a half way. With easy access off of State Route 14, the main Allison’s Meadow can be entered via Slow Creek, which curls around, connecting with Skipping Stone Court and Old Tree Court. The fifty or so homes are principally two-story, vinyl-sided structures with some brick facing. Smaller lots make lawn maintenance a breeze. Good street lighting provides sense of security. With only one main entrance, the community offers a low-traffic environment. Median prices of these homes is in the $180,000’s. Your nearby Greenville County education development locations are Bethel Elementary School, Hillcrest Middle and Hillcrest High Schools to name a few. Allison’s Meadow residents don’t have far to go for all their shopping needs. Groceries can be found less than five minutes away at the Publix at Mauldin Square supermarket. Nearby restaurants include Silver Bay, The Pasta House, Papa John’s and Anita’s Mexican Restaurant all within a mile or so. The Hillcrest Memorial Hospital just is three miles away.